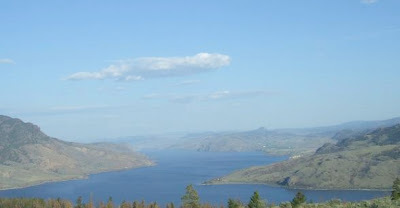 View of Kamloops Lake, Savona, B.C. It was the Victoria Day long weekend and we weren't able to go RV'ing, but we did get an evening visit with our son and his family where they were RV'ing for their long weekend. 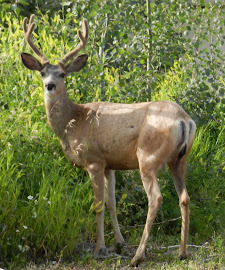 They have property on the north side of Kamloops Lake, opposite Savona. It is a little over an hours drive from Kamloops and is an absolutely beautiful location. The picture above is taken as we leave the main road to access their property and the view of Kamloops Lake is so gorgeous. 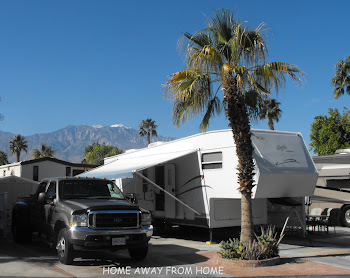 They have room for our RV so when retirement and time allows us to, we will enjoy this beautiful spot. Kamloops Lake is a jewel and has only recently received some of the attention it deserves with the Tobiano Resort development, which has a marina. It is the only marina on the lake and makes summer boating much easier. Boat traffic seems to be increasing since the marina opened last year. This is a great new thing for many Kamloops boaters to be able to explore the lake and it's little coves, but I think the residents of Savona have always known they had a jewel.